Mann Engineering displayed at the renowned Farnborough International Airshow 2016. As you can see from the photo we were prominently displaying at the front of the very impressive Ireland Aviation and Aerospace stand jointly sponsored by Enterprise Ireland. 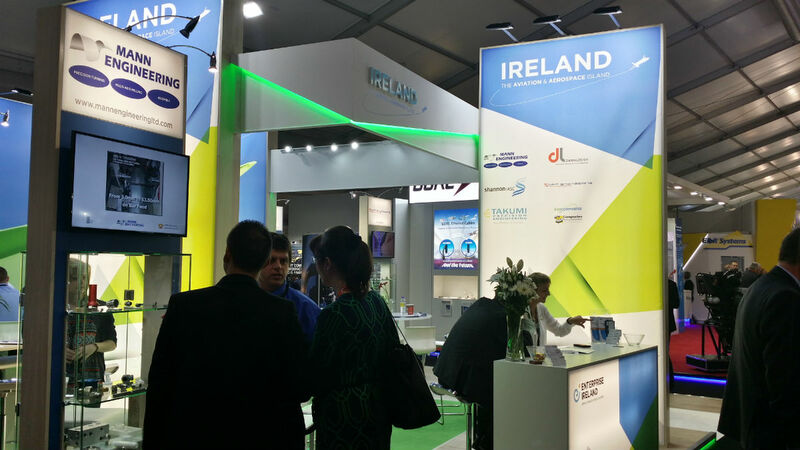 This was the first time in over two decades that Enterprise Ireland sponsored companies have displayed at this world renowned event in the Aerospace calendar. What we learned from Paris 2015 we tried to put into practice over the last 12 months. In that time we have passed AS9100 stage 1 which is the requisite accreditation acquired to be able to work for Aerospace clients. Stage 2 and full accreditation will be achieved by the end of September 2016. Mann Engineering are also members of ADS (Aerospace, Defence, Security, Space) which is an association covering the UK and Ireland with over 700 members. As members of ADS we are also striving to attain SC21 Bronze status. During the course of the Farnborough International Airshow 2016 we have many meetings already arranged with potential clients and expect to receive many others at our stand. The Mann Engineering team working at the show over the week comprises of Managing Director Rolf Fuhrmann, Business Development Pat Coldrick, Engineering Manager Mick O’Dwyer and also Emma Tobin, a local student from Duncannon, County Wexford, who has just completed her first year in Aerospace Engineering at the University of Limerick. Mann Engineering strive to always look to develop young local talent through links with local schools and universities in the various aspects of involvement in the running of Mann Engineering as a business.